When NieR: Automata was announced at E3 2015 it was, in its own way, the surprise of the show. When the first Nier game launched in 2010 it was met with middling sales and a middling critical response, and developer Cavia met an untimely end not long after. Five years later, a sequel was one of the most unlikely things that publisher Square Enix could have announced. In the years since its launch, however, the original Nier has attained a cult status thanks to the idiosyncratic swerves it made in both story and gameplay. 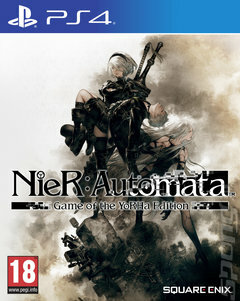 While Cavia is no more, director Yoko Taro is back with other key team members from the original to ensure that Automata measures up to the weirdness of Nier and Platinum Games is on hand to iron out some of the kinks and provide a silky smooth action experience. Automata takes place thousands of years after the original, so while a few narrative threads connect the two games newcomers don't have to worry about being left behind. Mankind is living in exile on the moon, forced from its homeworld by an invasion of machines from another world. Humanity now fights a proxy war on the Earth's surface, sending down androids, called YoRHa, to fight against the invaders. Players take on the role of one such machine, catchily named 2B, and are assisted by her companion, 9S. Like its forebear, Automata is an action RPG, with bouts of combat interspersed with sections of adventuring and exploration. Unlike its forebear, Automata has Platinum Games (famed for the likes of Bayonetta and Metal Gear Rising) ensuring frantic, fluid combat. Most importantly, like the original players can expect this game to frequently challenge their expectations and dive into big themes such as what it actually means to be human. The NieR:Automata Game of the YoRHa Edition includes the base game along with extra digital content including the 3C3C1D119440927 Expansion DLC, 6 pod designs (Grimoire Weiss Pod, Retro Grey Pod Skin, Retro Red Pod Skin and Cardboard Pod Skin) and Machine Mask Accessory. Additionally, the PlayStation 4 system version includes a Dynamic Theme, 15 PSN avatars,the Play System Pod Skin and the amazarashi Head Pod Skin.